Every child needs a loving and permanent family. However, when an orphan “ages out” in China, they lose their chance to be part of a family, where they can feel safe and be loved. At the young age of 14, these children are deemed ineligible for adoption, and their hope for a bright future all but vanishes. This is the situation Rebecca would face, unless she’s able to find a family who can bring her home by her 14th birthday this January. Rebecca is a lovely and smart young girl, who is outgoing, active, and gets along well with others. Her caregivers describe her as being obedient, sensible, and polite. She enjoys singing and will often perform at school events and at the orphanage. This year she won the second prize in a singing competition! Click here to watch a video of the talented Rebecca singing beautifully! Rebecca is missing her left eye and has corneal leukoplakia in her right eye. However, her right eye has some sight, and she’s able to walk around freely in familiar environments without assistance. Currently, she attends a school for children who are blind, where she’s performing very well. Her cognitive and language abilities are normal, and she can read in braille. Rebecca earns excellent grades and has been awarded “Triple-A” student every year. She has expressed to caregivers that she wants to be adopted by an American family and desires to have a home and parents of her own. Would you consider giving Rebecca a 14th birthday that she will never forget? 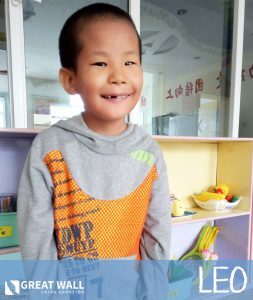 If you would like to learn more about adopting this sweet kid, please contact China Adoption Specialist Heidi at heidi@gwca.org today. We hope that Rebecca can find her Forever Family soon and experience the love and care that she deserves. Visit our Waiting Child photo listing to request Rebecca’s file! What does it mean to ‘Age Out’?